January 13, 2013 - Lluvia de Oro mine site visit to review new initiatives aimed at improving gold recovery operations and strategy to ramp up the mining rate in 2013 with the new site management team. October 17, 2012 - Mining continues at Lluvia de Oro in the Creston Pit and mining of the La Jojoba deposit has commenced. NWM is projecting 20-25,000 oz. Au production in 2012 and is expecting to ramp up in 2013. November 18, 2011 - This report is an update covering the past two weeks (November 5th to November 18th) of mining and construction activities at the Lluvia de Oro/ La Jojoba mine site in Sonora, Mexico. September 9, 2011 - The exploration department is working on the organization of the new drilling program scheduled to begin in October, in the Lluvia de Oro and La Jojoba areas of the mine site. 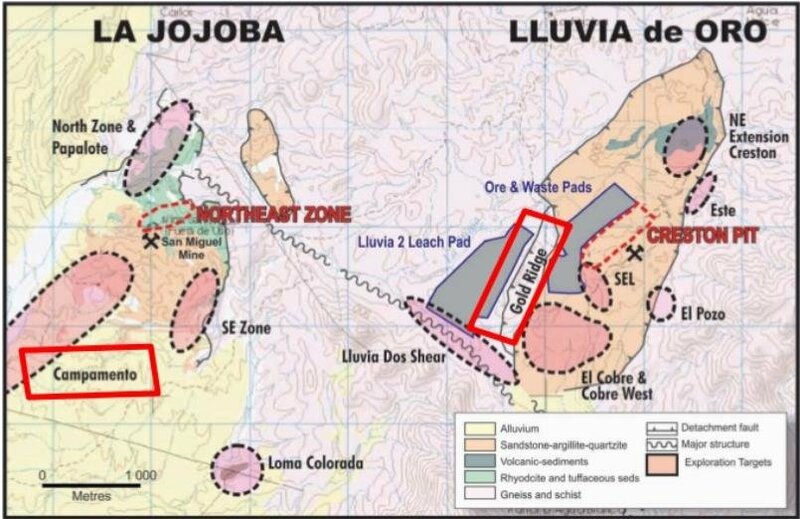 August 26, 2011 - During the first part of August the exploration department began to plan a new drilling program scheduled to begin in October, in the Lluvia de Oro and La Jojoba areas of the mine site.